Top Rank promoter Bob Arum has big plans for five division world champion Nonito “The Filipino Flash” Donaire should be put on an impressive showing against former European champion Anthony Settoul in Macau on July 18. He said Donaire’s manager Cameron Dunkin had spoken to him about the Quigg fight after the British boxer’s handlers showed interest in facing Donaire. Quigg himself said on Sky Sports TV that Donaire “has been making noises that he’d like to fight me” and indicated that it could be the easier fight to make than a showdown with Carl Frampton. Quigg added that after he does his job against Martinez then he’d be ready to discuss a Donaire fight. Both Donaire and Quigg are heavily favored to win although Quigg returns to the ring after a lengthy layoff following a unanimous decision over Hidenori Otake in his fifth title defense on November 22, 2014 before he underwent surgery on his right hand one month later. 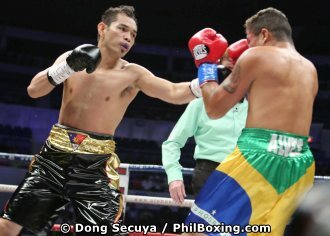 Donaire (L) stopped Brazil's Prado (R) in his last fight at the Araneta Coliseum on March 28, 2015. Photo by Dong Secuya.